It has dawned on me that whilst I don’t pay a lot a month for hosting, I do actually pay something and so not keeping this blog up-to-date could be construed as a waste of money. With that in mind I have an update – hooray. I built my first guitar more than 10 years ago, whilst still at secondary school. I had only been playing for a few years, and I wanted something that would stand out both visually and aurally. I started with a strat body, and a random neck I bought off eBay. I cut the scratch plate out of some clear acrylic, and mounted combination of a P-90, humbucker and single coil pickups. These were all wired together through a vast array of switches to enable me to switch any combination of pickups in both parallel or series, and either in or out of phase. Looking back it was a hideous rats nest of wiring, but that was nothing compared to the paint job. I sat in the garage with my sister, who was 5 at the time, and we painted it with all the paints I could find. It was gloss, matte, and metallic, with a crackled finish in areas. Since then I’ve bought 2 more guitars, and modified the wiring each time, but now I am more selective over the components. I try to select parts that match the current hardware, or add functionality without adding to the part count. All of this is leading to the real point of this post. I am designing a guitar pedal. I have been meaning to design a pedal for a number of years, and I had no real reason to not do it. Every time I would sit down and work out what it needed, but I would always be put off by one aspect or another. There are hundreds of questions that stop me from progressing. What do I want the pedal to do? How do I control the modification to the sound? Is a 12bit ADC and DAC going to be enough? Do I have an analogue front end to mix the effect in, or deal with it in digital? Do I want a “true bypass” pedal, or is all the signal going into the processor at all times? Do I stick with what I know and use Microchip’s PIC32, go for a multi-core Parallax Propeller, or try my hand at one of Freescale’s DSP chips? Instead of letting the questions buzz around, I took the plunge and started the design of my pedal. The signal is first passed through a capacitor, effectively removing the DC component. The signal is the biased at Vcc/2, and pass through an op-amp – TI’s LMV321. This will apply some gain to the signal, before feeding into the ADC – Microchip’s MCP3202; a 12bit ADC. It’s not the best ADC on the market, but it’s pretty cheap and will do the job for now. The digital data is then read in by Microchip’s PIC32MX764F128H. With a core frequency of 80MHz, this should be more than enough to perform some basic effects. Following manipulation, the data is then sent to the DAC – Microchip’s MCP4822; a 12bit DAC. Again, it’s not the best DAC around, but I am not aiming for that yet. Finally, I used a unity gain buffer to match any impedances, remove any DC component, and allow the next device in the chain to handle the signal. The parts selected were spares left over from previous projects. The only new purchases were the 6.35mm jacks and metal 1590A enclosure. It should be obvious that this is not going to be the best pedal in the world. I’m sure that any analogue aficionado will berate me for my choice of op-amp, and any audiophile will say that the minimum number of bits to consider would be 24. But they would be missing the point. This pedal is my start line. It will allow me to see the weak points in the design. I should have mapped the control rotary encoders to an “Interrupt-On-Change” pin as the are a bit slow to respond, or sometimes appear to run in reverse. I should have use a codec IC with build-in 24bit ADC/DAC. I should have used analogue switches to bypass the circuit when disabled. By this time next week, I will have some answers. After antagonising over this pedal for years, I have finally started. I spent around 2 days drawing a schematic and laying out a PCB. There’s some code still to be done, but a lot of it was written in the 2 weeks waiting for PCB’s to arrive. I’ve got PCBs from iTeadStudio for $27.59 (under £20), and all my components for around £25. For under £50, I have designed a programmable multi-fx guitar pedal. And I have no doubt that I’ll be doing the same next week. This entry was posted in Hardware and tagged guitar pedal, hardware, opamp, PIC on July 22, 2013 by admin. It’s been over a year since I’ve posted anything, but I’ve got some projects in the pipeline that will feature here. Until then I thought I’d share something I put together to help sort out a Texas Hold’em poker tournament I was involved in a last year. It’s a speadsheet that helps calculate what Small Blind/Big Blind betting progression to use. In the run up to the tournament I did a load of research into blind structure that turned out to be quite complex. This site talks about a lot of the theory that my document is based on. The spreadsheet (located here) allows you to enter the number of players, how much the buy-in is, and what chips you have available. It features 4 blind progression models, and I’ve included a GREEN/RED flag notification that warns you if some settings aren’t ideal. This entry was posted in Random Chat and tagged poker on June 7, 2013 by admin. A few months ago my place of employment and enjoyment suffered a catestrophic electrical failure. We recently installed some power factor correction equipment on our three phase mains setup – presumably to save money when powering running some of our more inductive loads. For those that dont know, power factor is the ratio of real power and apparent power. We use a large number of transformers and motors, thus presenting a large inductive load to the power supply. Inductive loads cause the current waveform to lag behind the voltage waveform. Apparent power is measured in VA and calculated by multiplying the RMS of voltage by the RMS of current. Real power is measured in Watts and calculated by xxxxxx. Typically, power companies charge residential users based on real power, whereas industrial users are charged for apparent power. This means that cost savings may be acheived by ultising power factor correction in industry. Cutting a long story short, apparently something went wrong whereby the neutral had become disconnected, and one of the three phase lines was used as a return path – or something like that. Needless to say, work sure was fun that day compiling a list of all broken equipment. Around ninety percent of PC’s required new power supplies, all the printers requred replacing, and approx fifty percent of monitors had a nice puddle of eletrolytic sitting at the base. Annoyingly my monitor was the only one in my department to remain completely opperational so everyone else has been gifted with new 24inch screens and I have to make do with a 21inch. The only other monitor to struggle on was a Samsung SyncMaster 245B, that suffered a flickering backlight a week later. This also made it to the scrap pile, where it stayed – until today. I cracked the case open expecting to find puddles of electrolyte or scorch marks, but found none. Inside were three PCBs – control board, power board and backlight inverter. A casual check over the boards didnt reveal any blown componentry, although some of the resistors showed signs of extensive heat. The display was in perfect condition, other than the backlight, so I instantly dismissed the control board. I didn’t fancy going near the inverter quite yet, as neither my multimeter of myself could withstand a jolt of 3kV. I checked all the obvious voltage points and all the values read as expected. I reconnected the inverter board, and all 6 CCFL tubes so see if the flickering settled down or got worse over time – in a bit to identify a temperature dependant behaviour. Instead I noticed that something was buzzing along with the flicker of the backlight. As carefully as I dared, I moved my ear closer to the 3kV and 240V voltage sources in a bid to locate the buzzing. As it turned out, the buzzing was coming from the power board, so the inverter was eliminated for now. The power board supplies the inverter with 24V, which measured dead on 24V without the invertor connected. Once connected, this 24V showed a 4V ripple which was well in excess of anything I was expecting. In my experience, a ripple is caused by unsuitable de-coupling. Granted, my experience is purely low power stuff, but let’s see where this goes. Taking my unsuitable de-coupling theory, and the fact that a load of input protection had been “tested”, gave me a somewhat high expectation that the component in question was the 82uF 250V capacitor. I de-soldered the capacitor and it only measured 6uF. Clearly, if this wasnt responsible for the flickering, it would still require replacing as it was somewhat out-of-spec. I managed to source a 82uF 240V replacement capacitor and soldered it in place. Tentitively, I powered the monitor back on, and… it worked. I mean, of course it worked – how could it not work. Unfortunately, I sourced an 85deg rated capacitor as a replacement for the 105deg version, but it should hold for now. Hopefully, this replacement will be a statistical outlier, and give me a few years of use – but if the backlight starts flickering I actually ordered 2 replacements. This entry was posted in Hardware and tagged hardware, power factor, repair on May 15, 2012 by admin. The LCM7215’s arrived as I was writing the last post, so I need to get the PCB’s cut. As I have access to a LPKF ProtoMat C60 PCB cutting machine I have designed a number of boards that fit together to give the case. The idea is that the first board sits on the underside of the battery back with the electronics on the bottom side. Then two lots of the third PCB sit underneath, with the second PCB being the bottom of the case. These will be glued together, and M3 nuts will be glued in place to receive some M3 bolts mounting the battery case securely. There are two 5mm holes to accept a suitably sized screw. To finish it off I’ve embedded a video. This entry was posted in Hardware and tagged hardware, opamp, PCB on February 15, 2012 by admin. I’ve got some LCM7215’s on order for a work project so I’ve got some downtime until they are due to arrive. I’m going to run through the LTSpice simulation process, and look at the alternative solutions available. Assuming you haven’t already, you will need to download LTSpice. This is a free Spice simulator provided by Linear Technology. It’s pretty basic, but it has almost everything I needed to get off the ground. By using the following equations I managed to select starting values for my oscillator. Using R = 255k, R1 = 1M, R2 = 255k, and C = 10u, we have a T of just over 11 seconds. Interestingly, when I simulated the circuit, my T was around 4.4 seconds. I am using fairly large values as I want to limit the current. The output is fairly constant, but there are a number of problems with my current circuit. Firstly, I want to use a single supply op-amp. This means I need to create a virtual ground or else the op-amp will be driven into an undefined state. 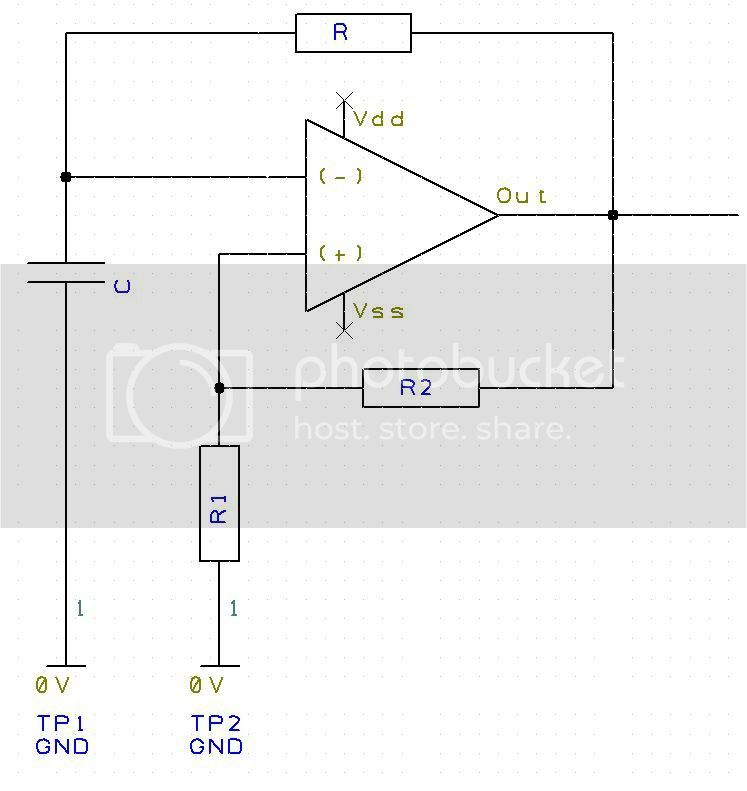 The simplest way of acheiving this is my tying the inverting input to Vdd through a resistor equal to R1. Next, my output has a duty cycle of 50%. This is a problem as I want my device to be as low powered as possible. A reduction from 50% to 2% duty cycle would reduce my current consumption by a factor of 12. That is the battery would last 12 times longer. To adjust the duty cycle you need to include a diode in parallel withthe negative feedback loop. The idea is that the diode will all the capacitor to either charge or discharge quicker, depending on the polarity of the diode. As we want the capacitor to charge quicker we need to allow the current to flow to the capacitor quicker. Lastly, I have specced out the op-amp that I want to use. The LMC7215 is a low power single supply rail-to-rail comparitor that ticks all of my boxes. The only problem was that it is a National Semiconductor part, and LTSpice is Linear Technologies. This means that the part won’t already be contained in one of the built-in libraries. That means the non-inverting pin is called “3” and its netlist order is 1. The inverting pin is called “2” and its netlist order is 2, etc. Once that is set up, you can run the simulation. With the circuit designed and simulated it is time to lay out the PCB. Unfortunately for you, I use EasyPC at work, and as that’s what I will be using to lay the PCB out in. I have given you the tools to create your own flashing light project using an op-amp as the starting point. Next article I will be laying out the PCB, and designing an enclosure for it. Before I go, I wanted to run through the other two options. The PIC is based around the PIC18LF14K22. This is a low power device, and I happen to have some left over from my electronic dice project (still waiting for PCBs). Not much to say here. I’ve connected up the header pins for the ISCP, and using a 560R resistor I’ve connected both pins of the LED to the PIC (anode to digital pin, cathode to analogue pin – diode “points” to the analogue pin). The 555 circuit used a 560k resistor, 15k resistor, and 10uF capacitor to give a period of around 4 seconds, and duty cycle of 97%. By reversing the diode and connecting to Vdd the LED flashes briefly for 105ms, and stays off for 4 seconds. Again, the 555 is just too power hungry, and the PIC is a bit of a waste of technology. I admit, I could use a PIC10 or PIC12 and get better usage, but I left assembly behind more than a few years ago and I’m not planning on looking back. As luck would have it the LCM7215’s have just arrived on my desk. 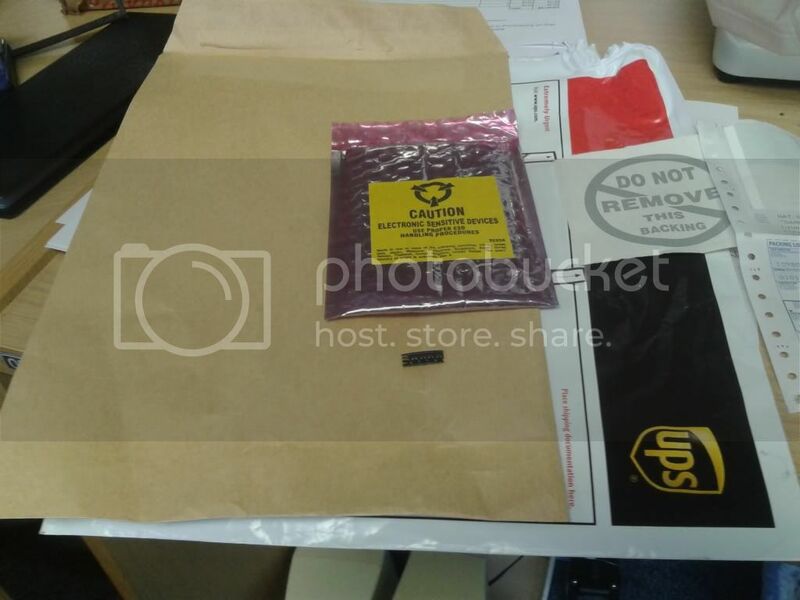 And yes, the 5 SOT-23 devices did come packaged in an A4 envelope. 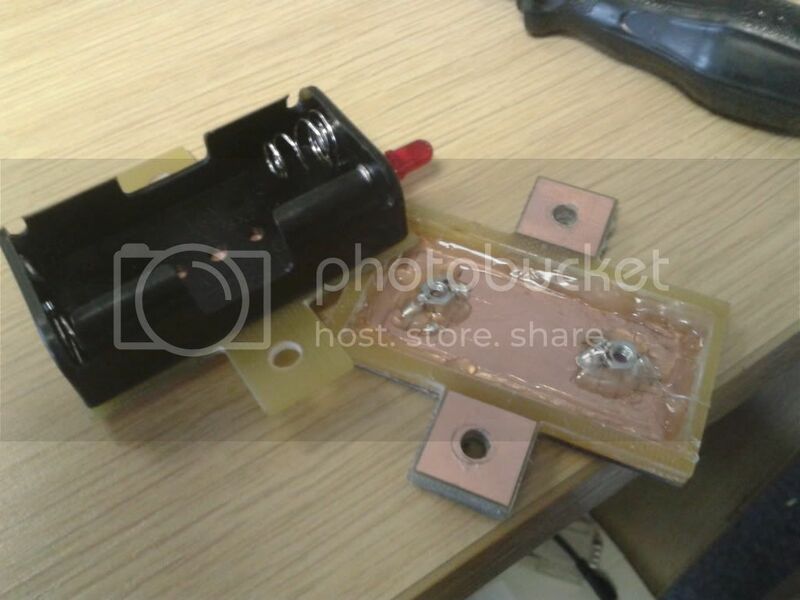 This entry was posted in Hardware and tagged 555, hardware, ltspice, opamp, Tutorial on February 13, 2012 by admin.